Seraquin for Cats and Small Dogs. A nutritional supplement to support and maintain normal joint function in Cats and the smaller dog. Whilst both glucosamine and chondroitin need no introduction as to their beneficial effects, cats are often not thought of as benefiting from their properties. Use daily for the relief of pain and to increase the mobility of your cat suffering from stiffness and arthritis. If the weight of your pet is >10kg use Seraquin for Dogs 2g. Reduce the dose after 4-6 weeks as you see the beneficial effects. Inactivated Yeast, Glucosamine HCI 125mg, Chondroitin Sulphate 95mg, Hydrolysed Chicken Protein, Maize Starch, Saccharose, Standardised Turmeric Extract 13mg, Maize Protein. Our Siamese cat has arthritis in her leg and loves these tablets - she sees them as a treat, so can recommend these. What a difference! Daisy has been through the mill what with pemphigus foliaceus, diabetes, becoming a non diabetic cat and then this year pulling her shoulder jumping from the fence. She is a 12 year old tortoiseshell who thinks she's a kitten! She was limping following pulling her shoulder and after conirming with the vet that there was nothing serious she was still stiff especially when getting up from her bed. I found Seraquin at a great price at VetUK and decided to give it a try. A miracle! Daisy has no signs of limping at all and climbs the fence with ease! I have even noticed Poppy,Daisy's sister, benefits from it too. Both of them have a glossy shiny coat as a bonus since taking seraquin. I'd recommend anyone to give it a try. All testimonials on VetUK sing its praises and that was why I gave it a go! Vet recommended these for our cat - she broke her hip when a kitten and now has arthritis, she's been taking these for some years and we now don't need to give her painkillers. My 12-yr-old moggie has arthritis in her lower back and her knees. 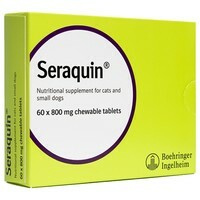 My vet recommended seraquin personally as he'd given them to his own older, arthritic cat and seen it make a difference. I started my cat on them right away and it has indeed helped her. For one thing, she finds them very palatable & I give her the daily seraquin dosage the way I would provide cat treats. For another thing, taking these non-prescription supplements cuts down on the amount of prescription arthritis medication that she needs. Great stuff! Superb is the only way to describe this. I did wonder if my cat would take to the tablets but she has and now very morning she sits and waits for me to give it to her. I am really pleased as she gets very stiff in her hind legs and hips. She is a lot happier already which is a great relief to me. I know that these will help her especially during the wet and winter months. Highly recommended. My vet recommended Seraquin as my cat had broken her pelvis before I got her. Being a young cat he thought we should give this a try and it worked! She could not climb easily and was in obvious dscomfort, but now has no problems, and happily takes the tablet from me whole. Buying them here saves me a fortune - at least £10 per box, so we're all happy! My vet recommended this for one of my Westies. She is much less stiff and the big bonus is that she actually enjoys taking them. My very fussy old cat (20 this year!) has always been a nightmare to get pills into. But she absolutely loves Seraquin and eats them straight out of my hand like a treat. And more importantly, she's like a different cat since taking the pills. The stiff gait is now much easier and she's even managing to jump onto the bed and chairs again. An easy medicine to give as my cat eats it from my hand quite happily or if it is left in her bowl with biscuits. It helped her stiffness noticebly for about a year but now needs meloxicam too from the vet. The vet reckons that the Seraquin lets her function on a tiny dose of meloxicam.